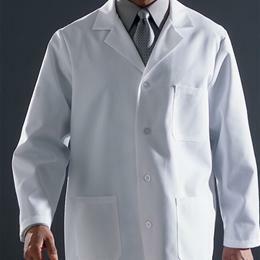 Staff Length Lab Coat: In An Easy Care, 80% Polyester/20% Cotton Poplin Fabric That'S Designed To Resist Wrinkles. Button-Front Styling With Two Lower Pockets, One Chest Pocket (With Pencil Slot) And Side Vent Openings For Easy Access To Pants Pockets. 39" Length. White, Size 46.